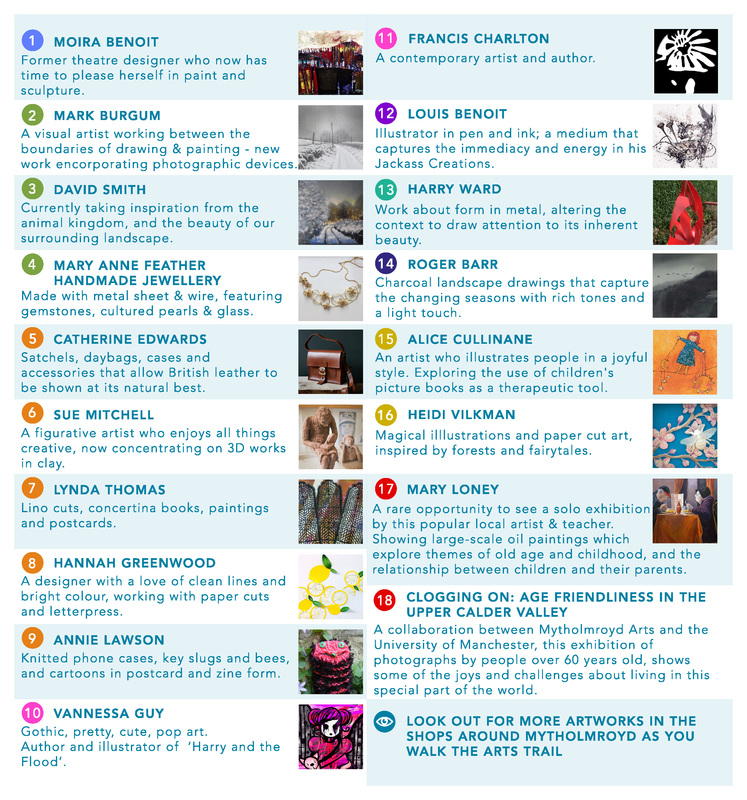 The 2018 Mytholmroyd Art Trail features nearly twenty wonderful Mytholmroyd artists at venues throughout the village. Leaflets with map and artists details will be available over the weekend from St Michaels Church Hall, Mytholmroyd or can be picked up in local venues in Mytholmroyd, Hebden Bridge, Sowerby Bridge and Halifax. 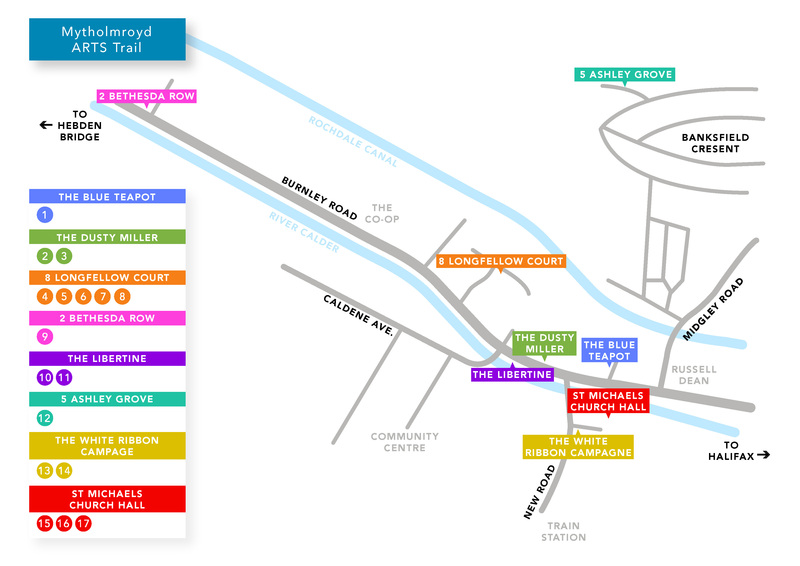 An Access Guide for the venues will be available at St Michaels, and can also be found below the map. Venues will be open from 11-5 on Saturday and 11-4 on Sunday but please note that The Libertine will open at 5pm and will not be open during the day. Blue Teapot 2 steep steps (greater than 17cm) into café. Once inside, small toilet, great assistance if requested. 90 minute limit on parking in Grange Dean doctor’s car park. 8 Longfellow Court Can get on to pavement with scooter, accessible into house and exhibition all on ground floor. Local parking. 2 Bethesda Row Narrow doorway with threshold. Limited space for parking scooter. Street parking only. The Libertine Accessible to art display, however ramp at back door is inaccessible due to flood work. Parking at Community Center near by. 5 Ashley Close Not accessible by scooter or wheelchair as no accessible route from street below. The White Ribbon Campaign Upstairs rooms at White ribbon only accessible by stairs. Not wheelchair accessible. 5 steps to entrance and threshold but has side bars. Good parking close by in St Michaels Square. Thanks to the Disability Access Forum for providing advice on disabled access. We have all done our best to provide accurate information but can’t be held responsible for any errors.